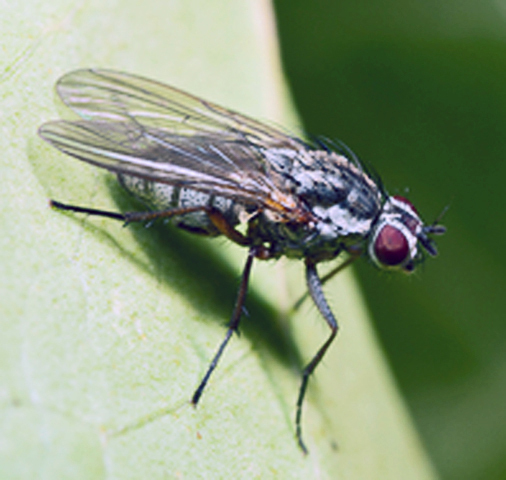 The carnation fly lays its eggs in late summer / early autumn on the leaves and stems of carnations and pinks. On hatching, the resulting larvae tunnel into the leaves and shoots of the host plant, and feed on the tissue between the upper and lower skins of the leaves. This creates the tell tale whitish tracks across the leaves. This is easiest time to control them. Do this by removing the affected leaves and burning them. There are sprays available that can partially control their progress, but once they have tunneled into the plant tissues such treatment is not always a success. The larvae will continue to feed until the first frosts then move in to the soil below to pupate, then emerge in spring as the weather warms up.